Between new-product reviews, tutorials for a timesaving trick, posts from your favorite blogs, updates from the sites you have to follow for work, and—because everyone needs a break, right?—the latest YouTube meme, it can be hard to keep up with everything you want to read online. No wonder people clamor for a “TiVo for the Web.” Enter read-later services: When you see something important, click a browser button or email the link. Then, at the end or beginning of the day, open the read-later app on the device of your choice—typically a smartphone or a tablet—and download all the content you flagged earlier. Now you’re set to read on your commute, during a plane trip, or just about anywhere, even if you don’t have an Internet connection while you're on the go. You can choose from a range of features with these services, which include Instapaper, Pocket, Readability, Quote.fm, Evernote Clearly, and Safari’s Reading List. Do you simply want to maintain a reading list, or could you use help from friends to find more interesting things to read? Do you want archival access to the items you’ve read in the past? How about tools for sharing your favorite articles with buddies or adding the stories to the other apps and services you use? There are more questions to answer than you might think, so I’ll try to help you get started. How do I add articles to my reading list? That’s the easy part. After all, none of these services would be very good if creating a list of things to read later were difficult. Read-later services add a button or bookmarklet to your browser so that you can add articles with one click. Here you can see the buttons for Safari's Reading List (A), Pocket (B), Readability (C), Quote.fm (D), and Instapaper (E). Typically you install some sort of browser add-on or bookmarklet and then click a button to add an item. But some services—namely, Instapaper, Pocket, and Readability—also give you a private email address for adding articles. This feature is especially useful if you’re browsing on mobile devices such as Apple’s iPhone and iPad, which don’t support browser add-ons; since you can email article links, you can still add to your reading list. Many iOS Twitter clients, including the company’s official options, the free Twitter for iPhone and Twitter for iPad, let you add your Instapaper, Pocket, or Readability credentials. (Twitter’s app supports only the first two.) Usually you can find the option in the app’s settings. Just add your credentials, tap through to read a link, and then tap an action arrow to send the article for reading later. Most of the alternative browsers and even newsreaders you can download for iOS and Android, such as Flipboard ( ) and Pulse, also support sending the current article to Instapaper, Pocket, and Readability. All read-later services let you read stories offline, whether you’re commuting or traveling, or if you simply don’t like using public hotspots. But the experience varies. Although most of these services strip out all content from webpages to provide a, shall we say, slimmer reading experience, Safari’s Reading List is an exception: It downloads an entire copy of the webpage and displays the whole thing for reading, even while you're offline. This approach is presumably a response to content providers’ concern that, in stripping out other Web content, read-later services also remove ads—one of the few (perhaps only) ways most site owners make a living. Instapaper (left) gives you just the article content, while Safari Reading List (right) downloads the entire page, with advertisements, for offline viewing. Reading an article on an iPhone with Instapaper. Even though this may be the post-PC era, you have probably noticed that PCs are still alive and plentiful. All the read-later services that I mention here noticed as well, so they offer full-featured Web apps that work just fine in a good old-fashioned desktop browser like Apple’s Safari or Google’s Chrome. But what if you want to plow through your reading list on your smartphone or tablet from the comforts of anywhere but your office desk? That’s where things can get interesting, depending on which device you want to use. When it comes to the biggest choice of apps and platforms, Evernote, Instapaper, Pocket, and Readability are your best bets. All have clients for Apple’s iOS and Android. Evernote—which bills itself as a “remember everything” service—pulls ahead a little in terms of the sheer number of apps available. Evernote Clearly works with Chrome. The Evernote app works on the iPhone and iPad. You can also find an impressive library of alternative Evernote clients with all sorts of features and purposes at Evernote Trunk. Quote.fm recently released an iPad app. And, of course, Apple’s Safari Reading List works on all Apple devices. If you’re an Amazon Kindle user, Instapaper and Readability are good options. Both offer ways to get articles onto your Kindle, but Amazon may require a fee for wirelessly delivering such content, so be sure to read the instructions. What if I don’t have anything to read? Quote.fm is built around social reading, encouraging you to share and discover new stories through friends and key quotes. 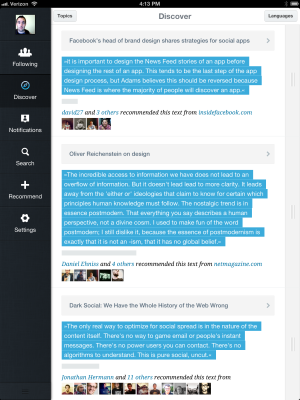 If you could use some help with discovering great stuff to read, Instapaper and Quote.fm are both great options. Under the Browse section at Instapaper’s website, you can find friends either by email or with your Twitter account. (On iOS, go to the Friends section and then tap the Friends button to search your contacts, Facebook, and Twitter.) Once you add friends on Instapaper, the website’s Browse section and the iOS app’s Friends section will be populated by articles that your friends like. You can also scroll down a little farther on the website, or look in the iOS app menu, for “The Feature,” which is a “hand-picked selection of the finest articles and essays saved with Instapaper.” To like any article on Instapaper, simply click or tap the red heart. Quote.fm has even stronger friending and discovery components, as the service was built largely around the idea of social reading and discovery. The Discover tab at the top can show you the most popular or recent articles that users are sharing, as well as the typical quote that users share to help highlight why the story is interesting (hence the service’s name). You can also plug in your Facebook and Twitter accounts to search for friends on the service, or check the hand-picked recommended user list. Articles are great, but what about videos? I have good news and bad news here. The bad news is that, to my knowledge, no read-later service can download videos for use offline, probably due to both technical and potentially legal difficulties. 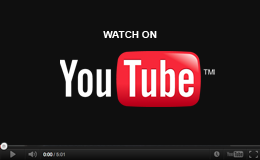 The good news, however, is that read-later services can catalog video links along with the rest of your content. When you have an Internet connection, you can tap through and watch the video. 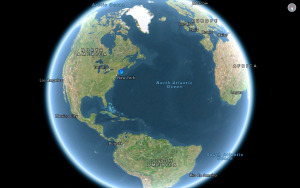 Pocket's media-friendly interface accommodates both read-later and watch-later needs. It is worth noting that, if your read-later needs lean much more toward "watch later," Pocket pulls ahead thanks to its media-friendly interface and a couple of handy features. For example, Pocket automatically creates a sort of media quilt out of all the links you add, so articles with photos and YouTube links can make for a visual treat. You can also filter your Pocket account just for videos, making it a little easier to stay on top of your favorite Web series and all those memes. Instapaper includes great sharing support. Reading is a social experience for many people, so the ability to plug in your social media accounts to share good reads, as well as other tools, is a must. If you’re nodding your head right now, check out Instapaper and Pocket, which both feature support for a wide variety of services including Facebook, Twitter, and Tumblr, as well as not-so-typical options such as App.net and Pinboard. Pocket and Instapaper offer different advantages. 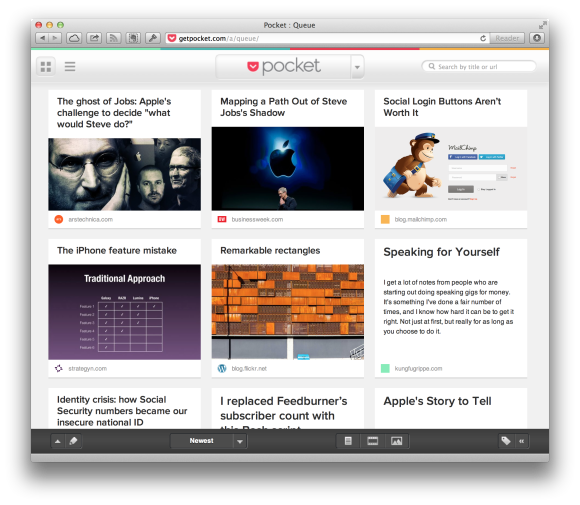 Pocket can share to a few more services, like LinkedIn and Reddit. But Instapaper matches Pocket’s support for working with other apps, including Things and Twitter clients. It also adds a few different apps, such as Delibar, Due, Agile Tortoise’s Drafts, and iCab, the iOS browser alternative to Safari. Plus, Instapaper has a neat feature that lets you automatically share to a handful of these services and apps all at once when you like an article. It’s great for cataloging your favorite articles on Tumblr or filing them away in Evernote, or for effortlessly powering your company’s social feeds with relevant articles. Here's another easy part, at least for now, because all of these services let you start out with a free option. 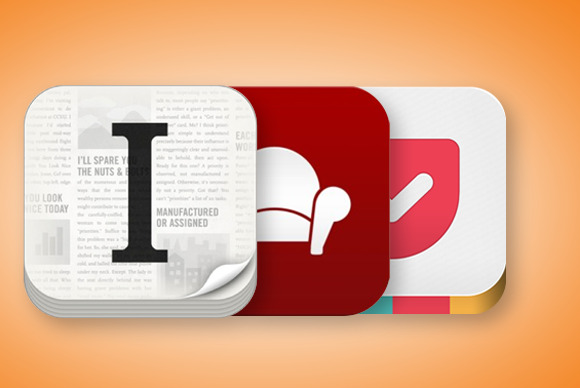 Only two—Instapaper and Evernote—have paid premium plans that unlock additional features. Instapaper’s subscription plan charges $1 per month, billed in increments of three months, to enable wholly optional extras such as the ability to search inside every article in your archives and the ability to use third-party Instapaper apps. Evernote Premium, which costs $5 per month or $45 per year, enables a number of features that aren't really related to using it as a read-later service, such as a higher 1GB monthly upload limit, the ability to take entire notebooks offline, priority support, the ability to collaborate on notebooks with other people, and more. I’ve spent a fair amount of time using every service I selected for this piece, and as in any competitive market, they each have their strengths and weaknesses. No matter which one you choose, though, I can say you’ll end up with a good “TiVo for the Web” that will allow you to read more of it on your own terms.